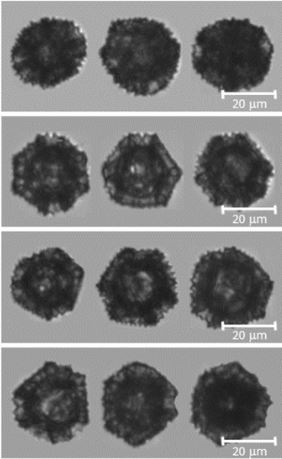 Pollen-based microcapsules such as hollow sporopollen exine capsules (SECs) have emerged as excellent drug delivery and microencapsulation vehicles due to their eco-friendly nature, uniform micron-scale size, and chemical and physical stability. Natural pollen species such as dandelion pollen grains offer diverse architectural features such as large internal cavities and a tough outer exine layer that can be readily prepared and utilized as microencapsulation materials. Microencapsulation is a process that applies a shell layer around a core particle to control the rate of chemical reactions, protect bioactive ingredients during digestion, and extend the rate of diffusion of fragrances and aromas, among other applications. Visual analysis following the microencapsulation process is necessary to verify the stability of the process and the quality of the shell layering.